Three outstanding Belizeans were the first to receive special year-end awards presented today by the Amandala newspaper, for their outstanding national contributions. 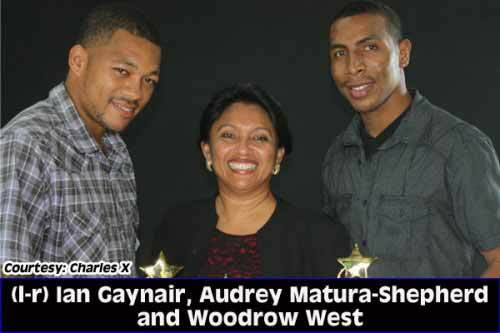 They are Woman of the Year: Audrey Matura-Shepherd, and Men of the Year: Ian “Yellow” Gaynair and Woodrow Wilson West. Amandala has previously acknowledged persons for their nationalistic contributions by featuring them on the front page of the year-end issue. This time, the newspaper has decided to take things up a notch, by presenting rosewood awards to the recipients. “I can’t even explain how I feel! The way I feel right now is like when I had scored that goal against America. Awesome feeling!” said Ian Gaynair, who plays right defense for Belmopan Bandits, and who scored Belize’s only goal in the CONCACAF Gold Cup 2013. “Every time I receive an award, I realize how grateful people are,” West told us. West and Gaynair are being acknowledged by Amandala for turning down a match-fixing bribe in July this year, when a European who had befriended them in Guatemala incidentally showed up in Portland, Oregon, trying to get them to “sell out” the game. West said that the man told them that if they could promise they would lose their match against the USA, he would give them money to take care of themselves and their families back home. West said that they got very angry and walked away, but the man, with a backpack full of US bills, grabbed their arms, still trying to persuade them. “He took out a lump sum of money out of his backpack,” West said. That money, he said, was to pay them for not even reporting the attempted bribe. The men did make a report, however, and Interpol got on the case. Gaynair said that the match-fixer had taken them out in Portland to eat buffalo wings, but after he learned of the European’s true motive, he lost his appetite and left the venue, and was so angry, he forgot how to get back to the hotel. West and Gaynair could have easily settled for the bribe and fast money – but instead they chose honor. Gaynair said that he grew up off Vernon Street, near Berger Field, and making it big in football was always his dream. “I just continued dreaming my dream. I worked hard, I struggled and slowly my goals started to come true,” he told us. Norman ‘Tilliman’ Nunez and David “Manu” McCauley were the Belizean icons who inspired him to excellence. “Every day I wake up and said, ‘I will chase my goal…’” Gaynair said. “I never dream small. I always dream big, and so I try to be successful in life,” he went on to say. For his part, West was fond of watching soccer matches on TV: “My aim is to go as high as I could,” he told us. For now, though, he is looking forward to finishing the championships with the Bandits. “I want to do that first and see where I go from there,” West said. Matura-Shepherd has a lot on her plate. She will continue to be involved in the fight against offshore drilling – a cause she led while she served as the Vice President of Oceana in Belize; but she happily relinquished that job in order to retain her liberty to express herself as an Amandala columnist. She left Oceana in August and launched private practice. She said that “when that critical moment came and I had to make that choice, I wasn’t angry with anyone; I was at peace with myself, because I knew in my spirit what I had to do and I did it. So from then on I think it was the best choice. I think it was time to move on. Oceana was a very good phase in my life. I did what I had to do there. I wish them all the best, but there’s more for me to do in this country,” said Matura-Shepherd. Matura-Shepherd said that she had held back from doing what she really wanted to do to help others while she was at Oceana. “Now that I am an attorney, no holds barred! I will go out there and I will fight. I am a fighter. I will fight until the very end,” she said. But the fight is not a one-woman battle. She said that each person can do their part in the struggle. To the ordinary person, Audrey says, you just have to have a passion and willingness to serve and you can make a positive difference. She said that there has to be a groundswell from the people. “For too long, Belizeans have sat back and expected other people to do [for them], and so while I do my share, I don’t want other people to think that I am their savior and I will do everything. I will do my part, but everybody has to do their part too,” she urged. Amandala celebrates the awardees for their gallant contributions.